Watermelon diet is a great way to cleanse your body and lose weight fast. Watermelon is an outstanding diuretic - following the watermelon diet for 5 days you will detoxify your body cells leaving them refreshed and rejuvenated. If you have a hard time to staying on a raw food diet or need a guide to get you started check eating for energy program that has FREE e-course and FREE raw food starter plan. But this raw food diet is very easy to follow because all you need is watermelon and willpower! You should eat about a pound of watermelon 5 times a day. It is recommended to eat a little less watermelon (about 3/4 of a pound 5 times a day) if you have high blood pressure, decreased blood flow, nephritis, gout, kidney or liver disease, or obesity. Make sure to consult your doctor before going on a diet! 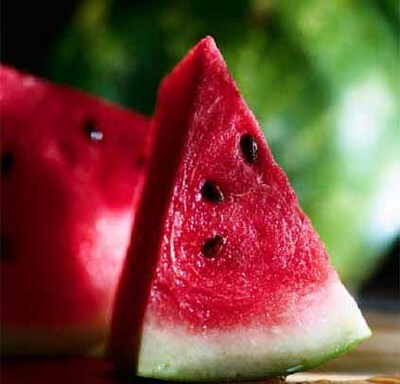 The diuretic and dietetic properties of watermelon have been recognized long ago. Professionals suggest eating only well ripened watermelons as they contain most vitamins and minerals and least nitrates which may poison your body. This diet belongs to the group of extreme mono-diets (where you are allowed to eat only one product). Because of its nature the duration of the diet should not exceed 5 days. During that period you will stabilize the amount of sodium in your organs, and as a result get rid of excess liquid and slags from your body. Ideally you should try to consume about a pound of watermelon for every ten pounds of your body mass. Warning: this diet is not recommended for people with kidney stones, diabetes, or pancreas disorders. If you start feeling discomfort after the first day of the diet, discontinue the diet immediately and consult your general practitioner if your condition worsens. However, if you feel fine on the second day of the diet bravely continue it to the end. You will be able to loose up to 7 pound in those 5 days. After that, continue the light version of this yummy diet for another 10 days. Breakfast - 1 bowl of oatmeal with 1 slice of cheese. Lunch - 6 oz of fish, beef or chicken with 1 plate of vegetable salad. Dinner - watermelon (1 pound for every 30 pounds of your body weight). After the total fifteen days of this delicious watermelon diet you can loose up to 15 pounds! Try it – it is so yummy and so easy to follow! Banana diet is a delicious and easy way to lose weight and improve health. You have probably heard dietitians talking a lot about how bananas are one of those fruits you should avoid especially if you are on a weight loss diet because of the high sugar content. Using green tea for weight loss is an effective and easy way to shed excess fat and get into great shape without having to go on a strict diet. In fact you can lose up to ten pounds in just 5 days! Try it and see for yourself. 4 day diet plan is a fast and simple way to cleanse your body from toxins and lose few extra pounds. This is a raw food weight loss and detox diet and it is especially effective if you use organic products. Mediterranean 5 day diet is very yummy and fun to follow. The 1000 calorie menu of this diet plan calls for extra virgin olive oil, fresh herbs, lots of fresh fruits and vegetables, plain yogurt, lean meats and fresh fish. The following 7 day diet plan has a healthy well-balanced diet menu. You will have a guaranteed stable weight loss at a healthy slow pace without getting the ‘yo yo’ effect after you are done with this diet. Lean Cuisine diet is great for those of us who want to loose weight but simply do not have enough time for complex diet plans. It is perfect for people with busy and fast lifestyle who do not want to deal with messy and time consuming homemade meal preparation. This fast diet is especially designed for those who are devoted to wine and would love to include it in a weight loss diet. Many studies investigated the benefits of red wine suggested that moderate amount of red wine (one drink a day for women and two drinks a day for men) lowers the risk of heart attack for people in middle age by 30 to 50 percent. In the fashion world models are required to be particularly conscious with their figure and body shape. They put a lot of effort in maintaining certain body weight. They often turn to different diet plans and techniques to help them stay slim.